Lumberjanes was the perfect pick for 1am during the Readathon. It’s rollicking fun with a great cast of girls having adventures and being awesome. While I don’t require my adventure-having protagonists to be female, it’s really nice to see once in a while, you know? I wasn’t expecting the fantasy elements, but it wasn’t unwanted either. 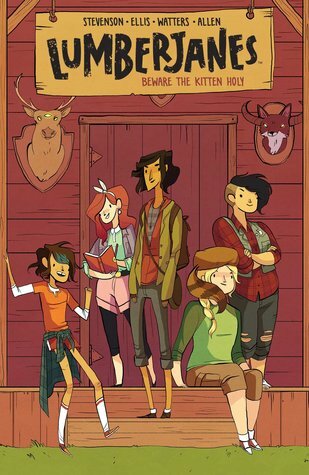 Lumberjanes totally lives up to the hype. 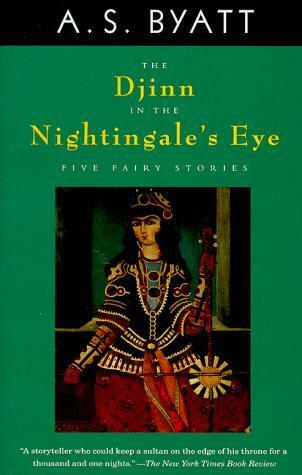 Despite the fact that they are a trope unto themselves, I think djinn are fairly underused in fiction. 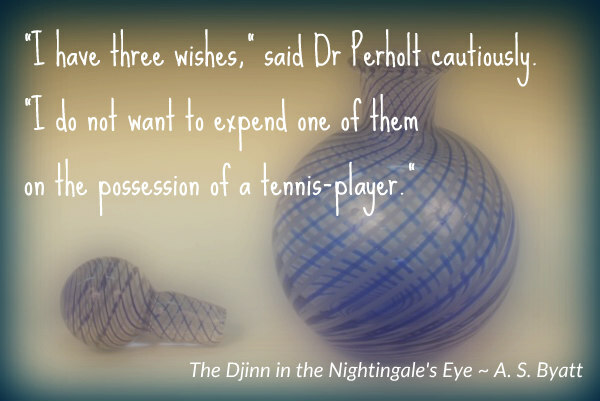 I always have my eye out for a good djinn tale. This one is excellent, about how power over someone else can mold their destiny. Weighty, but it’s told with a light touch and is very funny on occasion. With many allusions to other literature and set against an academic conference, it reminded me of being in college. Did you know that nightingale’s eye is a type of glass? I’ll be honest, I decided on this audio book after seeing a trailer for the impending movie. While not my usual reading fare, I was in the mood for a frothy romance. 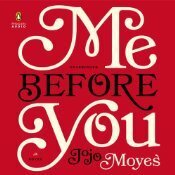 And, well, Me Before You has some of that…and quite a bit of seriousness too. I must say, I really appreciated the ending. Characters on the spectrum are tricky. There is the temptation to create a character that is inherently less than the audience; therefore, the reader can feel smarter and “in the know” in relation to the character. For me, The Curious Incident of the Dog in the Night-Time fell into this category. 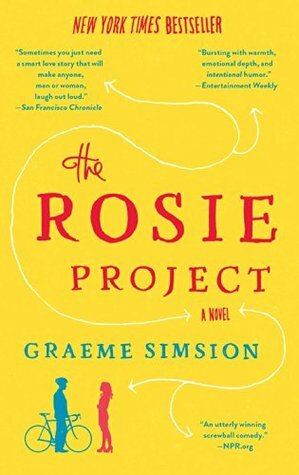 The point of that book seemed to be the story that the character wasn’t seeing, and I thought it put me, the reader, in a wince-worthy position. It’s also easy, I think, to go into the land of caricature. There is entertainment value in eccentricities. The problem with this is that many adults on the spectrum have found non-obtrusive lifestyle work-arounds. Maybe there is a little less eye-contact in social situations and a little more passion when discussing certain subjects (or even dispassion when discussing emotionally charged issues). The Rosie Project does do both of these things to some degree. There is a wide range of behavior on the spectrum and Don falls firmly into the amusingly eccentric. He has an immutable down-to-the-minute schedule. He takes the term “jacket” way too literally. He estimates a person’s BMI upon meeting them. These things are a little extreme. On the other hand, one of Don’s responses strikes me as fundamentally true for the people on the spectrum that I know (and maybe myself as well): when Don is told that the woman he’s going on a date with has firm beliefs he asks, “Are they evidence-based?” It’s not that there is an innate skepticism to people on the spectrum, but there is usually a firm default position that comes out occasionally. The other issue, the reader being the smart one, didn’t bother me much due to the genre of this novel. The romantic comedy is somewhat based on the audience presuming to know what is best for the characters. Most of the time, it’s only Don’s relationship with Rosie that we see “the truth” of. Often, Don can see the areas in which a faux pas might be made, and explains the methods he’s taken to deal with the situation or acknowledges, “yes, that was a faux pas,” which is certainly more the position of an intelligent adult. The story itself is a little wild, a little unbelievable maybe, but also fun. I enjoyed it more than I thought I would. The audio book I listened to was read by Dan O’Grady, a native Australian. It hadn’t sunk in to me that the book was set there so he was the perfect voice of Don. #RIPX ~ Peril in SPAAACE! That, of course, is the tagline of the movie that kicked off one of the scariest, most suspense-driven science fiction franchises of all time: Alien. In horror, isolation and the unknown are prevalent themes; ones that can be explored well in science fiction. To bring this around to my RIPX celebration, here are a few perilous sci-fi offerings that I’ve enjoyed lately. I don’t listen to too many audio books, but I wanted add some RIPX spice into my life while I did silly things like dishes and laundry. This is the novelization of the oft-maligned third Alien movie. Personally, I think the movie is pretty okay, directed by one of my favorites, David Fincher (Se7en, Gone Girl). 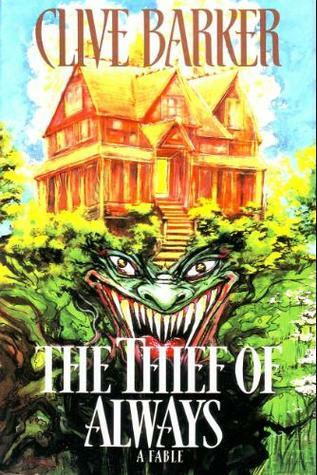 The story adapted by Alan Dean Foster isn’t half-bad either. The slam-dunk factor here is the narrator, Lance Henriksen. Henriksen is known for his many genre rolls as a character actor, including Bishop in Aliens and Aliens3. The sea-faring age had ghost ships, vessels that had met strange and mysterious ends and continued to sail without a crew and brought doom in their wake. Space-faring science fiction has often taken that concept and blended it with the horror theme of meddling with forces beyond human understanding. A rescue ship is sent to investigate the Event Horizon, a space vessel that had disappeared seven years prior. Event Horizon, unbeknownst to the general public, had been fitted with an experimental gravity drive that creates an artificial black hole in order to interdimensionally travel long distances in space. The rescue party finds an empty ship. The last video log graphically depicts the insanity of the previous crew. Is the Event Horizon haunted? Or has is breached dimensions better left unknown? This is a pretty tense film. Featuring Sam Niell (Jurassic Park), Laurence Fishburne (The Matrix), the acting is solid and so is the direction by Paul W. Anderson. It isn’t for the faint of heart though. Some of the most disturbing footage is only flashed for a few seconds, which leaves plenty of room for your mind to fill in the gaps. I’m going to admit it right now, this film might only be scary to me, and five year old me at that. The Black Hole was released in 1979 by Walt Disney Productions. I was a big Star Wars fan at the time (a fan of any science fiction, really) and my grandpa thought to to see it would be a perfect outing. (Grandpa and I went to see pretty much every Disney release/rerelease.) While it included a couple of cute, anthropomorphized robots, it was also Disney’s first PG release. I ended up having a few nightmares about the scary, anthropomorphized robot that ends up in “hell” with its creator on the other side of the black hole… (This didn’t stop me from owning a read-and-play record/book combination that I’m sure drove my parents up the wall as much as I played it.) On rewatch, the ending is still a little discomfiting. Neil deGrasse Tyson has called The Black Hole the least scientifically accurate movie ever, but I wonder if he’s taking into account that it was made in 1979. It does have the distinction of having the longest computer generated sequence ever (up until that time) included in its opening titles. A week ago last Sunday, I received a key to participate the EverQuest Landmark closed beta. I’ve been a casual player of EverQuest and EverQuest 2 for years, but was only mildly interested in playing Landmark, the crafting sandbox precursor to EverQuest Next. Did I want to play something that’s still a little buggy and not fully functional? The key gave me a week to play around and, on Friday when the free week was nearly over, I plunked down $20 to continue harvesting and building. Next thing I knew, thieves of time that are computer MMOs had done a number on me. It was Sunday and I hadn’t read a word in 48 hours. Queue the audio books. 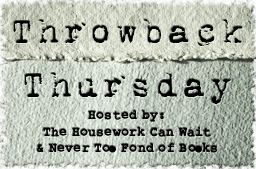 I hunted up some audio books specific to the Once Upon a Time challenge. I figured, I’m playing in a fantasy world (roughly), why not listen to some fantasy fiction? My first selection is a tad on the horror side, but still solidly in the land of fables. We begin in February, a gray beast of a month, with Harvey, a good kid who is terminally bored. He is the perfect target to be tempted by Mr. Hood and the Holiday House. Of course, there’s a catch and Harvey realizes that being a good, bored kid isn’t the worst thing. Despite the potential Bradbury feel of a 10-year-old learning to value time and mortality, this *is* a Clive Barker story. There’s some blood and gore. There are dead cats. There are scary, uncomfortable moments. Story-wise, the final confrontation between Harvey and Hood goes on maybe a little too long. The stakes alone are enough to make the battle important, not it’s number of rounds. This is a “reread” for me and I own the hardback. The main disadvantage to listening to it is not having Barker’s lovely, creepy illustrations. After a week, this is what I had built in Landmark. It needs more flowers. Charles Portis has long been acclaimed as one of America’s foremost comic writers. 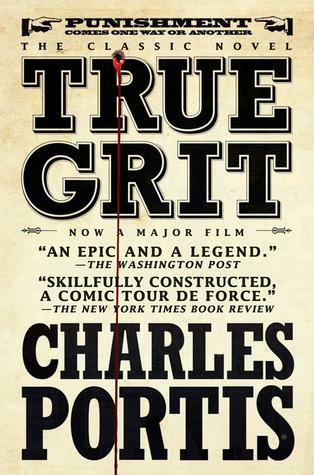 True Grit is his most famous novel–first published in 1968, and the basis for the movie of the same name starring John Wayne and now the film by the Coen brothers starring Jeff Bridges and Matt Damon. It tells the story of Mattie Ross, who is just fourteen years of age when a coward going by the name of Tom Chaney shoots her father down in Fort Smith, Arkansas, and robs him of his life, his horse, and $150 in cash money. Mattie leaves home to avenge her father’s blood. With the one-eyed Rooster Cogburn, the meanest available U.S. Marshal, by her side, Mattie pursues the homicide into Indian Territory. I finished listening to this yesterday, an audiobook borrowed from the Tempe Public Library’s new OneClickdigital service. I don’t think I’ve ever seen the John Wayne version of the film. Honestly, the B Westerns of the 50s-70s are the reason why I thought I didn’t like Westerns, despite my childhood affection for The Lone Ranger TV show. The 1969 version of True Grit has been (probably undeservedly) lumped in with those movies. My attitude toward modern Westerns is much different and, considering that I really like the Coen brothers when they’re being serious, the 2010 film version was a slam-dunk for my favor. What caught me unaware was Mattie Ross. I had no idea that the main character of the story was a 14-year-old girl. Further, I didn’t realize that the book is written from Mattie’s first person POV. I hate to just be sickeningly positive, but I like Westerns. I like frontier women. Why had no one told me about this novel? I’ve never like tomboy stories due to two reasons: 1.) Tomboys are usually trouble-making brats. It seems that girls can be virtuous and girly or disrespectful terrors. 2.) Not only do girls grow out of being tom boys (something that doesn’t bother me too much), but they seem to have to regain their virtue through hardship. In general, there’s no middle ground. I relate to these characters no more than I do uber-girly characters. The audio book was read well by Donna Tartt, a Mississippi writer. She also provides an afterword about her history with the novel, a book passed from one female family member to the next and often loaned but rarely returned. Thankfully, I’m currently in research-mode. If I were in writing-mode, my Nebraska characters would sound like Arkansas characters. I’m very prone to picking up Southern-isms. The 2010 movie is faithful to the book and full of great performances and beautiful Roger Deakins cinematography.